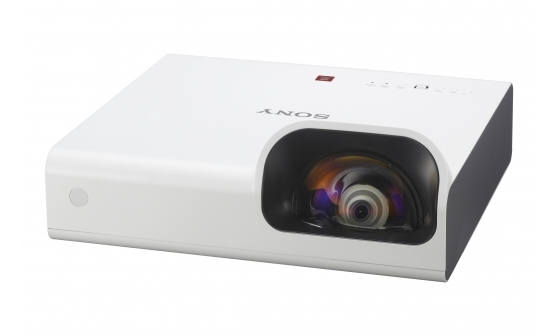 The wall-mountable short throw projector VPL-SX236 is suitable for using a projector with a white board. A Short Throw distance of 75cm for an 80” screen is useful for limited space in a classroom. The teacher can be free from the projector's glare and able to easily teach their students. By using this projector with an interactive white board the initial costs can be reduced. This projector has a long-lasting lamp of 10,000 hours. The Unique lamp dimming function by Sony reduces the lamp power usage and lamp power consumption. It's low TCO and usability means the user can enjoy bright images for a much longer time. VPL-SX236 is a colourful and bright projector. Thanks to the 3LCD Sony "BrightEra™", the picture is colourful and the images are bright. And it also has vivid 2,800 lumen with XGA resolution. These specs are best for a classroom environment. It's easier for all of the students to see with this big screen size. Smart Connection with PC, Tablet and smartphone is also supported. The wireless presentation capability makes it simple to present files from your PC or smart phone/tablet.